Google’s algorithm is constantly evolving to better understand search intent, and content creators must adapt to survive — by throwing out their keyword lists and grouping content into topic-based clusters. A content cluster structure helps Google to understand the relationship between different pages and determine which topics you’re an authority on. Ultimately, this will boost rankings, increase organic traffic and help relevant users to find you via search. So, what does this mean? Traditional keyword research is dead. Previously, keyword research was the backbone of every SEO strategy. Each page was mapped out to target specific words or phrases relevant to your industry. Google has made it clear that they don’t want us to work like this anymore. Back in 2016, Google began to drastically reduce the data available in Keyword Planner for non-advertisers, with further restrictions implemented later that year. 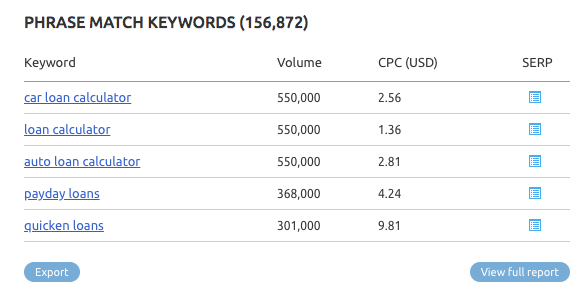 We are no longer able to see search volume data for variations of keywords. Searchers now use more natural language, and Google has reflected this in its algorithm updates, changing the way it prioritizes the content shown in the SERPs. Google doesn’t want content based on keyword research because users don’t want content based on keyword research. 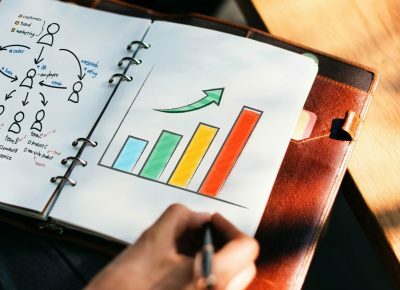 From content strategists to copywriters, all involved in the content marketing process would benefit from getting on board with this new approach. 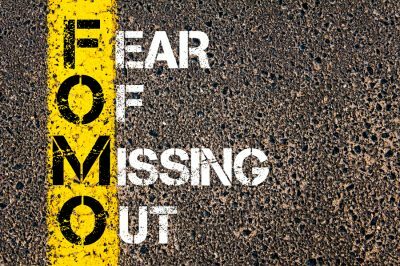 If you’re still providing your copywriters with a list of keywords to write around, you’re quickly going to get left behind. With the launch of Siri on the iPhone 4S in 2011 came a new phenomenon. People started talking to their phones. Since then, Amazon has shifted over 20 million Echo units (featuring Alexa) and Google have launched their version, Google Home. In fact, Search Engine Watch predicts that 50% of all searches will be voice searches by 2020. Instead of typing in fragmented keywords phrases, we’re now having conversations with our devices. 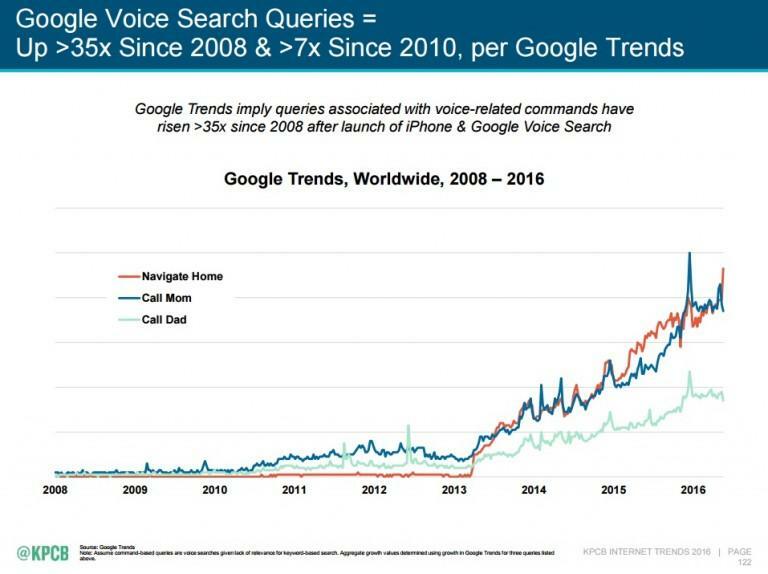 The advent of voice search means that queries are now delivered in natural language and this has begun to change the way we search. Google reacted with two major developments — Hummingbird and RankBrain. 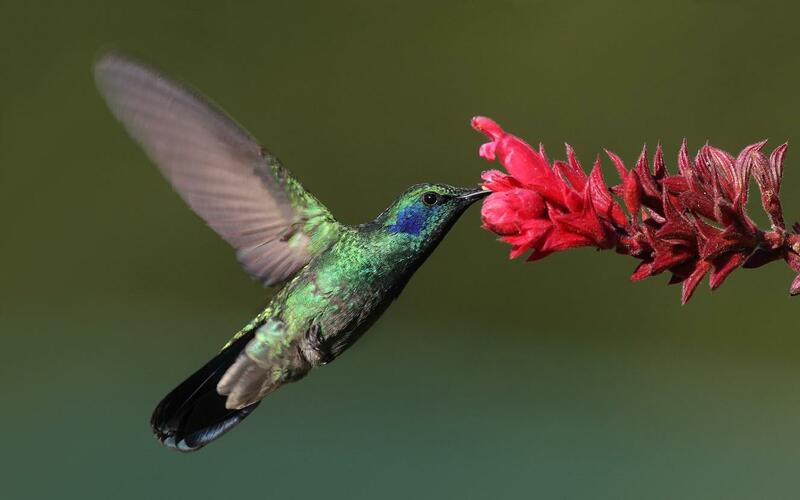 Introduced in 2013, Hummingbird was Google’s first move. The algorithm update focused on understanding natural language search queries and providing the right answers quickly and accurately. Next came RankBrain in 2015. It was developed to better understand search queries and measure user satisfaction with Google search results. How users interacted with the search results began to influence which results were shown. This machine learning algorithm is still evolving — over time, it’s getting better and better at understanding and delivering what users are actually looking for. As a result of these changes and updates, we now need to consider content and context. There are a multitude of factors that give context to a search query — for example, the user’s location, the time of day, their device, their search history, and much more. These now influence the results that Google displays — search is becoming personalized, which means the value of tracking individual keyword rankings is diminishing. Search results aren’t the same for everyone, so rankings can’t be either. In response to the challenge this presents, content creators must really focus on understanding the needs of potential customers. So, content creators must double down on providing value — by working out what value really means to our audiences. 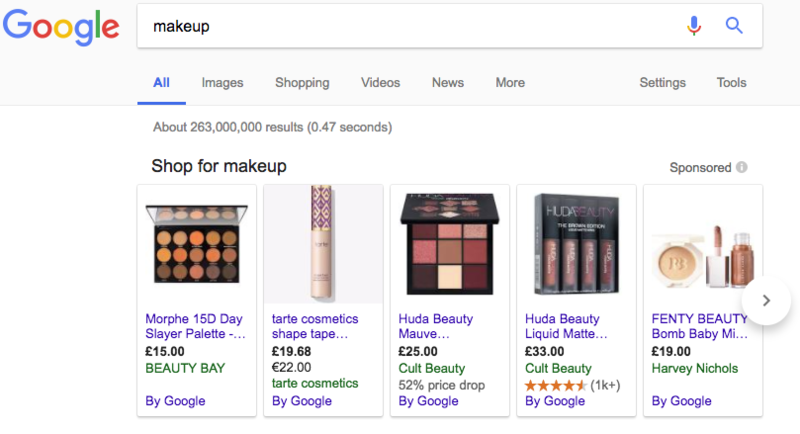 For example, if you’re searching for makeup, Google understands that you most likely want to purchase makeup. Or, if you type in a difficult word to spell, Google understands your intent and will correct your spelling and will show you a dictionary result. 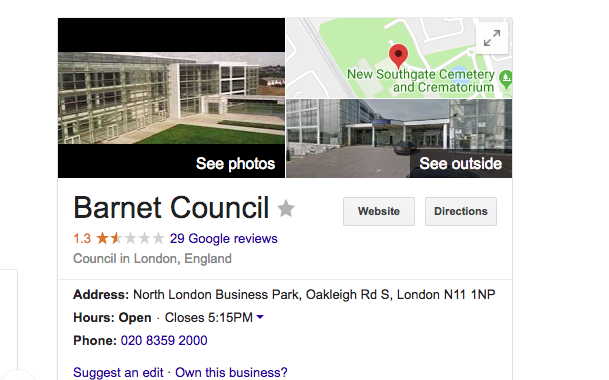 If you search for Barnet Council, you’ll get a places result with a map so that you can find your way to their location. Google looks to understand the context behind a user’s search and then provides trustworthy results to answer the user’s question. In the past, writing content for search engines has been about researching and targeting individual keywords with blog posts. 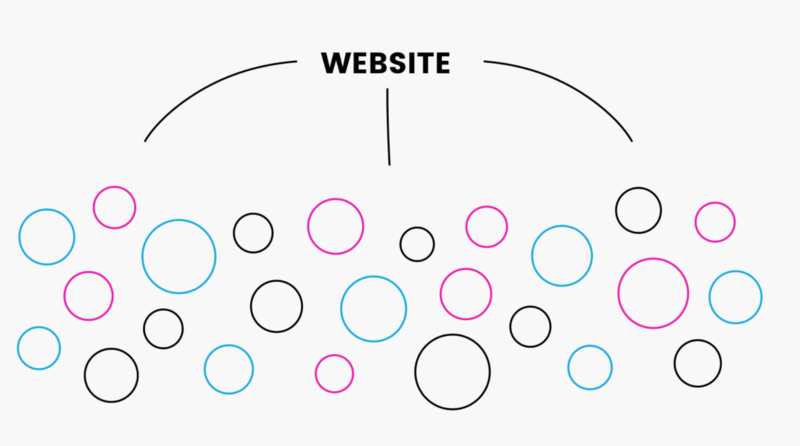 The problem here is that, as your site grows, the structure can become messy. Pages with similar content begin to compete with each other, and Google struggles to understand which articles to prioritize — and how they’re relevant to your key service offerings. If you’re just creating content when inspiration strikes, you need to think more strategically about your content. 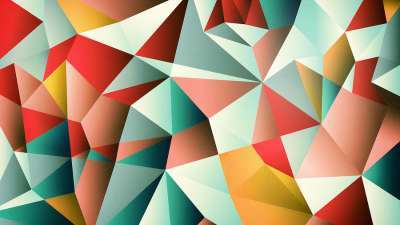 The problem with the ad-hoc approach is that Google struggles to find a pattern or identify relationships between your pieces of content. While one blog post may rank strongly for a particular keyword, Google will have difficulty determining your authority on the topic overall, meaning the rest of your content won’t see any benefit. But when you structure your content in clusters, Google will better understand how your pages relate to one another — encouraging an overall uplift for these pages when people search for your topic. Start by creating a content pillar page that outlines the topic you want to rank for, and as you build your related content, link back to it. This way of linking helps to demonstrate to Google the semantic and hierarchical relationship between your content. It also demonstrates the depth of knowledge on that specific topic, which means Google will recognize your pillar page as authoritative — which means better rankings. Can we create content around this topic long-term? Is there plenty to write about? Or, conversely, is it too broad? Do I really understand my audience and what they care about? What are they looking for online? How do I know this? 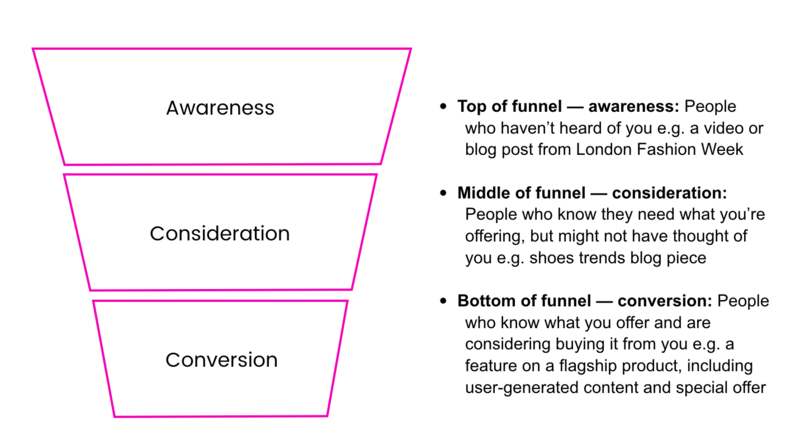 Have I thought about every stage of the customer journey, and can I create content that will guide users through the sales funnel? While all of your content should be well-maintained, think of your content pillar as the foundation that holds the rest of your related content together. It needs to be front and center stage. Above all, Google wants to provide searchers with trustworthy and reliable answers. Failure to do this would render the search engine pretty useless. If your content marketing efforts have historically been sporadic or loosely structured, you’ll need to perform an audit of existing content and begin grouping it into topical clusters. If I aim to become an authority on this topic, do I have a page that can act as the pillar? If I aim to become an authority on this topic, do I have enough supporting content? What content can I create to flesh out under-served topics? Does my cluster content include internal links back to the relevant pillar page? Before I take this topic any further, am I sure it’s going to bring relevant traffic that might convert in future? For your content to rank well, your site needs to be a valuable resource that demonstrates your authority in its niche. Backlinks from other quality websites will indicate trustworthiness to Google and increase the ranking power of your content. The key thing here is to always have your audience and niche in mind when writing your copy. Identify who your audience are, what content they’d want to read and in what context. By keeping this in mind, you’ll be writing content that users actually need, rather than just trying to hit predefined keywords. Google Trends is handy for identifying popular topics within your niche and also spotting trends. Answer the Public shows you what people are searching for and the language they use, so you have the query in mind when you begin to craft your articles. Google Analytics’s Affinity category can help you to learn more about what your audience cares about. This data gives you insight into your visitors’ lifestyles and interests — giving you a better idea of their overall identity. The Affinity category is really useful when it comes to creating audience personas for wider marketing, but also for deciding the direction of your content. You’ll also find In-Market audience data in Analytics. This shows you what people are searching for when they are actively looking for your product or service. This can be useful to give your audience more depth and the type of transactional queries they’ve been making. Data from Google Search Console will also show you what people are typing in to trigger your existing content to show up in the search results (likewise, search query data from Adwords can also be handy here). It’s also worth looking at competitors’ sites to see which topics they’re covering well, and which topics you’re better placed to talk about. If you’re competing against bigger fish, you may find more success in carving out niches that they haven’t yet covered, rather than challenging them in areas where they already have extensive content. Keep this in mind when you start to piece together your strategy. You also need to be honest with yourself about the relevance of each pillar and your current capacity to write around it. Do you have the expertise in house, or can you enlist the help of someone external who knows more? Quality really matters here, so it’s worth investing in expert help — just make sure that’s factored into budget. Too often, content marketers fall into the trap of creating as much content as possible, with the hope that it will drive more traffic. This is a waste of time. In order to make the most of it, you really need to lay out your strategy before getting started. Have you identified how you’re going to move potential clients or customers from the awareness and consideration stage and towards conversion? Have you conveyed to key stakeholders how much investment effective content marketing requires? There’s a misconception that if we create a brilliant piece of content with our content pillars, audience and niche firmly in mind, that it will likely take off virally and drive lots of sales. In honesty, this almost never happens. You’ll need to think about how and when you’ll retarget your prospects with the correct content. Every time a customer touches base with your brand, they’ll build up an image of trust. In the future when they’re looking for your product or service, they’ll be more likely to you. When we created a post about the benefits of teaching with an interactive projector for technology manufacturer, we first identified what would be useful for their customers and what they’re looking for online. Over time, this became the top organic landing page on the domain, behind the homepage. This shows what once piece of content can do — by providing value rather than chasing keywords, you can actually perform better in search. As with any channel or approach, you’ll need to have a measurement and reporting plan in place. This may seem to go against what I’ve already talked about, but you can still use keywords here to track visibility. You just need to group them by topic, and focus on the movement of the group, not the rankings of individual keywords. By tracking keywords at a group level, you’ll get an overview of which topics Google sees you as an authority on. If you’re ranking poorly for some topic groups, it implies that Google doesn’t recognise you as a reputable source for this particular topic. 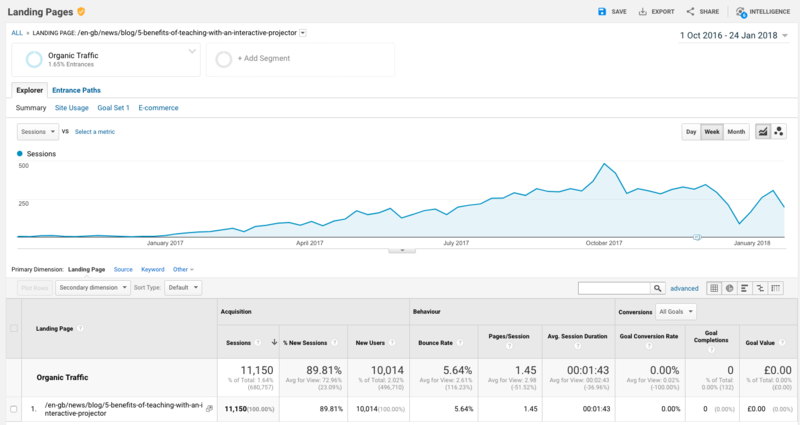 If you want to go deeper, you can group your pages by topic in Google Analytics and cross-reference your traffic with your ranking data. If you’re struggling to gain authority in a particular area, you can decide to direct more resources into creating articles around that content pillar. 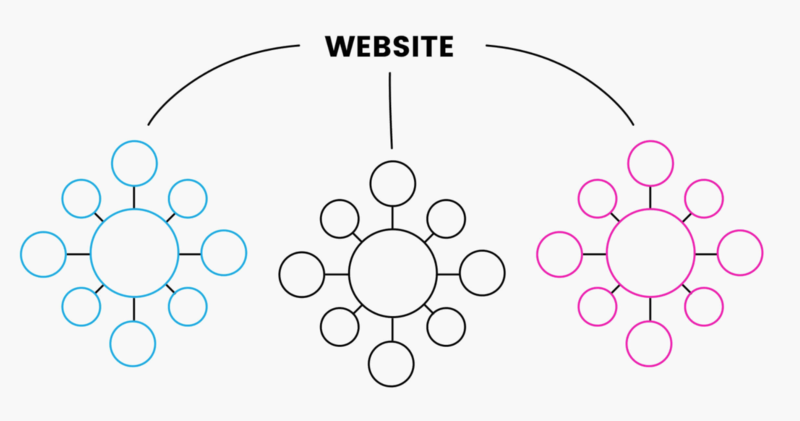 It’s time to seriously rethink your on-site strategy and begin to cluster together your content in a more organic way. Think about which topics you want to rank for and restructure your content around these pillars. Think about how and why people search, and write genuinely useful content around each of your identified topics. Cluster content will help Google’s algorithm to better understand what your site has to offer, and help relevant users to find it. What do you think? Is keyword research dead?